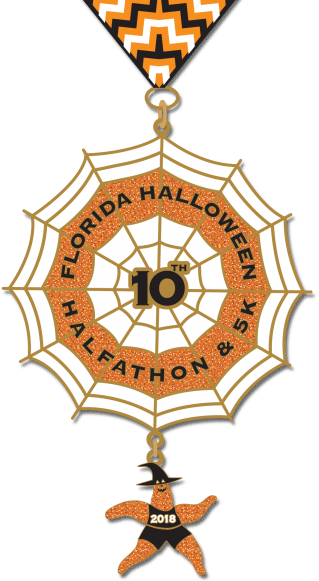 Registration is now OPEN for our Florida Halloween Virtual Runs during the weeks surrounding October 28 to coincide with the actual running of our races. 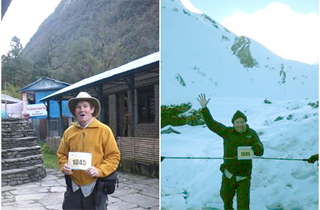 This allows athletes to run or walk anywhere in the world and still earn one of our finisher’s medals. In previous years, the Halloween Virtual Run provided funds for numerous non-profit groups including John Hopkins Magnet Enrichment Program, Tutterow Stars, Largo High Girls Cross Country, USFSP Club TRiO S4, Labrador Retriever Rescue of Florida, Calvary Chapel Running Team, U of South Florida All Stars, and Operation SNIP. 1) Registration is $30 for our Virtual run (any distance). International athletes are charged an extra $7.50 to cover the cost of international shipping. 2) Athletes can complete a Half Marathon or 5K during the 16-day period from October 21 – November 4. The distance can be broken up into shorter segments – your choice. 4) Please share your results, experience and photos at our Florida Road Races Virtual Run Facebook Event page. Your results will NOT be recorded as official results, nor will you be eligible for age group awards or rankings. It is not necessary to send us emails to report results, but you are certainly welcome to share your comments with us. 5) If we have medals left over after distribution to finishers on-site at our races, we will be able to ship virtual run participants their medal within a week or so after the event. 6) However, if we run out of medals, we will need to order new ones and it will take 5-6 weeks, as they will be manufactured overseas to our specific order. 7) Medals will be sent to virtual runners in the order of registration. This means some of you may receive medals within 2 weeks of our race, while others may receive them in 5-6 weeks. 8) Virtual athletes who complete our entire halfathon series from October thru March will also earn the opportunity to earn a series completion medal for just $10 to cover the cost of medal production and shipping. This purchase option will be available during registration for our series’ finale: the Florida Beach Halfathon & 5K Race.